The Polar Thematic Exploitation Platform provides a complete working environment where users can access algorithms and data remotely, providing computing resources and tools that they might not otherwise have, avoiding the need to download and manage large volumes of data. This new approach removes the need to transfer large Earth Observation data sets around the world, while increasing the analytical power available to researchers and operational service providers. Earth Observation is especially import in the polar regions at a time when climate change is having a profound impact and excitement about new economic opportunities is driving increased attention and traffic, resulting in concerns about the state of the region’s delicate ecosystems. Developing tools to model, understand and monitor these changes is vitally important in order to better predict and mitigate the resulting global economic and environmental consequences. Polar TEP provides new ways to exploit EO data for research scientists, industry, operational service providers, regional authorities and in support of policy development. Discover many more details about the Polar TEP project, including the context for a polar platform, available data, tools and processing services, examples of how the platform helps current users, how to register as a first time user and answers to many more questions. The Polar TEP (Thematic Exploitation Platform) is a public site to which registered users are allowed to upload content and anyone may view or download content. Users are responsible for knowing their rights to distribute information and for ensuring the appropriateness of information that they upload to the site. As a user of Polar TEP, you understand that you are the only individual to access these accounts and will not knowingly permit access by others without written approval. You understand that sharing login information with other people is prohibited. You understand that any misuse of assigned accounts and my accessing others’ accounts without authorization is not allowed. You understand that this/these system(s) and resources are subject to monitoring and recording and you will have no expectation of privacy in any use of these systems. You are responsible for using the computing systems, resources and facilities in an efficient and effective manner. You understand that you are responsible for protecting any information processed or stored in any accounts, which may include encrypting the data to provide protection that goes beyond the standard OS protection provided by the computing systems. You understand that you shall not engage in activities that compromise or weaken the security of Polar TEP systems. You understand that you shall not make copies of copyrighted software, except as permitted by law or by the owner of the copyright. You understand that you shall not attempt to access any data or programs contained on systems for which you do not have authorisation or explicit consent from the owner of the data or processor. You understand that you are required to report any security weaknesses in the systems or any IT security incidents including misuse or violation of this agreement, to the Polar TEP Helpdesk. Polar TEP is not to be used for any illegal activity. Any illegal activity will be reported to the authorities and may be liable to prosecution. The Polar TEP is governed by various laws and legislative provisions of the UK, including but not limited to the Computer Misuse Act (1990), the Protection of Children Act (1978), the Criminal Justice Act (1988) and the Prevention of Harassment Act (1997). The Data Protection Act (1998) applies to both Satellite Applications Catapult and any of Satellite Applications Catapult’s customers (“Customer”) in respect of the storage of personal data relating to third parties. To the extent that any Customer may be storing any personal data in the CEMS Environment, they must carry out internal checks as to the applicability of the Data Protection Act 1998 to that personal data. Under the Electronic Commerce (EC Directive) Act (2002) Satellite Applications Catapult cannot be held liable for any unlawful acts carried out using the CEMS Environment unless it has actual knowledge of those unlawful acts. In any event where Satellite Applications Catapult becomes aware of those acts it will take all necessary measures to prevent them from continuing. Knowingly infringing intellectual property rights (copyright, patents and trademarks) can be an offence under UK law. Customers may not use the CEMS Environment in such a way as to violate intellectual property rights and Satellite Applications Catapult will assist any rights holders in the enforcement of those rights were appropriate. Customers are advised to take all reasonable care and action to ensure that they do not break or breach the laws of countries outside the UK in their use of the CEMS Environment and to the extent that they may do so and Satellite Applications Catapult becomes aware of the same, it will assist in any party entitled to enforce those laws. Members who post information have the responsibility for assuring their content's appropriateness. All content should remain on topic. Fraudulent, harassing, obscene, or sexually explicit language or materials are inappropriate and not welcome. Mass solicitations (SPAM) are inappropriate. The collaborative websites do not moderate comments or user-created pages, but if an issue is brought to our attention, we reserve the right to remove content deemed inappropriate and take necessary action against the user. Transmitting, receiving or storing certain types of files can be an offence under UK law. Customers may not use the CEMS Environment to store, transfer or receive material of an indecent, offensive or otherwise illegal nature. These activities may result in criminal prosecution. Significant content on Polar TEP is user generated and it is not possible to provide assurance to the accuracy, relevance or usefulness of information published by users. Users have a responsibility to report any suspected weaknesses in site security and any incidents of possible misuse or violation of this agreement to the proper authorities by contacting the website administrator. All registered users have the ability and responsibility to notify the Polar TEP Helpdesk of inappropriate content. These notifications will result in the content being taken down for review and the owner of the content notified. Following review, the content may be removed from the platform. Users shall not divulge or share login information, such as passwords. Users are responsible for notifying the site in a timely manner if their account password is compromised. Users shall not purposely engage in activities to: harass other users; degrade the performance of systems; deprive an authorised user access to a resource; circumvent computer security measures or gain access to a system for which proper authorisation has not been given. The Customer is solely responsible for all content in their allocated Polar TEP (CEMS) environment and ensuring that the contents of their Polar TEP (CEMS) environment comply with all applicable UK laws and EU directives, and do not infringe the intellectual property rights of third parties. Users who post inappropriate or illegal material, or who use this website for illegal activities will lose access to their account and will be reported to the appropriate authorities. Users who are removed from the site and wish to reapply for access will be evaluated on a case-by-case basis. Should the User transgress again, they will be removed permanently with no recourse to reapply. Polar View Earth Observation Limited (Polar View) is developing a Polar Thematic Exploitation Platform (Polar TEP) for the European Space Agency (ESA). Polar TEP will provide polar researchers with access to computing resources, earth observation (EO) and other data, and software tools in the cloud. This new approach will remove the need to transfer large EO data sets around the world, while increasing the analytical power available to researchers and operational service providers. In the traditional workflow for the analysis of earth observation (EO) data, users download the data to their local site and then process it using their available software and computing resources. With the increasing volume of data available from missions such as Sentinel, and the resulting need for powerful computing resources for processing, the existing methods of working are inefficient and restrict the use of EO data. ESA’s Thematic Exploitation Platform (TEP) concept aims to provide a working environment where users can access algorithms and data remotely, providing them with computing resources and tools that they might not otherwise have, and avoiding the need to download and store large volumes of data. This new way of working will encourage wider exploitation of EO data. EO is especially import in the polar regions at a time when climate change is having a profound impact and excitement about new economic opportunities is driving increased attention and traffic, resulting in concerns about the state of the region’s delicate ecosystems. Developing tools to model, understand and monitor these changes is vitally important in order to better predict and mitigate the resulting global economic and environmental consequences. Polar View Earth Observation Limited is developing a TEP for ESA that will be customized for polar research and operational needs. Polar View brings a team to this project that combines a unique mix of polar domain experts, scientists, operational service providers, ICT experts, and user representatives. Polar TEP will integrate data discovery and access for a rich set of polar themed EO and complimentary datasets, a scalable computing environment, a suite of analytical tools and the ability for users to supply their own models, plus tools to allow sharing of results and promote collaboration. These resources will be accessed through a web portal. The platform architecture will be open, scalable and independent of any specific IT infrastructure. This approach will allow easy expansion of the platform’s capabilities, and encourage the development of a wider network of other thematic exploitation platforms. The polar regions are vast and have a growing significance for the entire globe. They play an important role in regulating and driving the global climate, but are also the regions experiencing the fastest increases in temperature associated with global climate change. Monitoring and understanding these changes is vitally important for everyone, not only the indigenous populations, since these changes will have global effects. In the coming decades and as global climate change progresses, the world’s polar regions will become significantly more important. As a source of natural resources and current low population density, the Arctic is of increasing interest to politicians and industry. Global interest is fueled by environmental concerns for the delicate ecosystems and by excitement over perceived abundance of oil and gas. Where the Antarctic Treaty currently protects the southern polar regions from some of this attention, nevertheless there are still real pressures to ensure the Antarctic environment remains protected from increasing development. Observations from space provide unique information which is essential for the successful understanding and management of climate change. The polar regions are remote and hostile environments where efforts to collect required observations and data are limited by very real constraints such as the weather, lack of infrastructure and long periods of polar darkness during the winters. 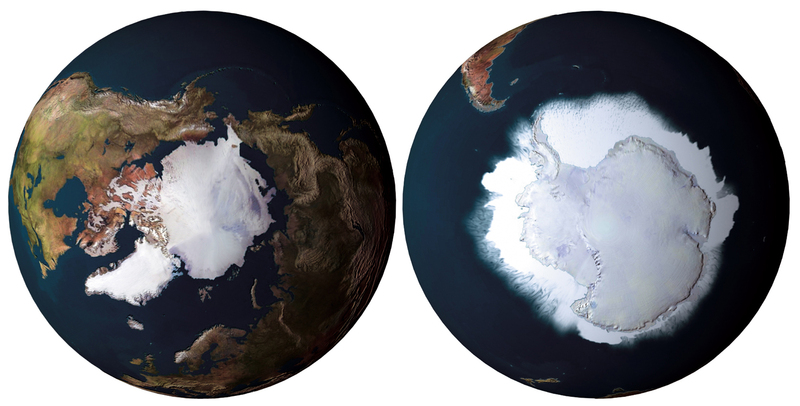 As a consequence satellite platforms provide the only source of consistent, repeatable, regional scale, calibrated, year-round data of the polar regions. The large number of EO satellites observing various aspects of the polar regions provide a comprehensive monitoring system for the maritime and land cryosphere. Data as a Service (DaaS) – On-demand data sharing through discovery, access, and transportation. Data sets will cover earth observation, air-borne and in-situ sensors, as well as other socio-economic data. The emergence of service-oriented architecture has rendered the actual platform on which the data resides irrelevant. Information as a Service (InaaS) – The ability to provide standardized and secure methods to create, manage, exchange, and extract meaningful information from all available data in the right format at the right time. Software as a Service (SaaS) – Delivery and management of applications and tools by PSEP or its users that are used remotely on the platform. Provides users with the capability to deploy user-created or acquired applications. Infrastructure as a Service (IaaS) – The provision of computing resources, complemented by storage and networking capabilities, as shared resources, scalable on-demand, and enabling cost efficiencies. 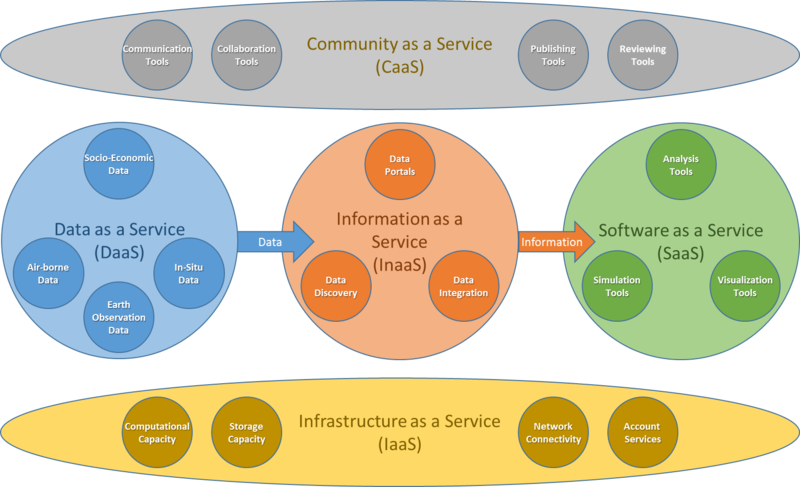 Community as a Service (CaaS) – Collaborative tools for users to publish, share and discuss their results, information, data and software/code on the platform. Social networking makes a new level of online collaboration among communities of practice possible. Antarctic ice shelves play a vital role in the global climate, producing significant water masses that drive ocean circulation and buttressing the rate at which inland ice sheets drain into the ocean. A recent study [RD06] suggests that the Filchner Ice Shelf region in Antarctica might soon experience a wholesale change in oceanographic regime with potentially dramatic consequences for the ice shelf and its tributary ice streams. A newly initiated large-scale study will use glaciological and oceanographic measurements to improve and validate a set of regional models to predict the regions contribution to 21st Century sea level rise. The lack of the ability to predict these changes was highlighted in the latest IPCC report [RD07] noting the risk of “Abrupt and irreversible ice loss from a potential instability of marine-based sectors of the Antarctic Ice Sheet”. 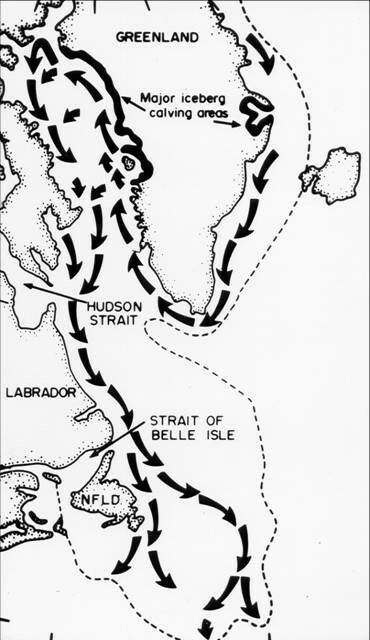 The observational inputs to this study are wide ranging, but will include satellite observations of ice stream surface velocities to be validated by in situ GPS units. Satellite derived data provide important details of spatial and temporal variation in ice sheet and ice stream velocity. Derivation of ice sheet and ice stream surface velocities is a computationally intensive process that requires large volumes of satellite SAR imagery. To cover the required area and time periods, data from a number of different satellite sensors will be involved. This raises the issue of inter-comparison of velocity data derived from SAR sensors with different characteristics (e.g., how do velocities derived from C-band Radarsat2 data compare with data from X-band TerraSAR-X data?) and using different techniques (e.g., how do velocities derived from interferometry compare with velocities from feature tracking?). The P-TEP will provide capabilities to answer a number of the issues involved. (a) The P-TEP will provide access to multi-sensor SAR data archives and processing capacity which will allow testing and running of large processing jobs to simplify the effort involved in generating the required velocity fields. (b) Capabilities in the P-TEP will allow inter-comparison of velocity fields derived from different SAR sensors and the publication of resulting statistics. (c) Validation of surface velocity data is a critical step. The P-TEP will allow easy integration of in situ GPS data to validate the derived velocity data. 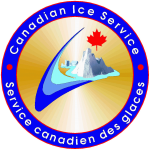 National ice centres throughout the world have mandates from their respective governments to monitor and chart sea ice and iceberg conditions in their particular areas of interest. This is a significant activity and involves the manual interpretation of large volumes of satellite data for ice chart production, which is labour intensive, slow and lacks consistency between ice centres as well as inside the same ice centre. With the large volume of Sentinel-1 SAR data expected from early 2015 onwards, a more automated and rigorous analysis method that allows the combination of SAR, microwave radiometer data, infrared data, scatterometer data and visible data, as well as state of the art numerical weather prediction data is needed. Current effort is directed at collation of data from multiple sources and (building on the previous development of satellite data assimilation in an ice analysis system) establishing an automated ice analysis system with the aim of being able to produce a regularly updated Arctic wide ice analysis every six hours. The data assimilation system will build on previous ESA efforts such as SAR Ice constellation (STSE), Sea-ice CCI, SMOSICE etc, since radiative transfer models and backscatter models developed in these projects will be key elements in quantitatively relating satellite observations to surface ice conditions. Development and operations of such a large scale and complex data assimilation system will depend on established access to all required datasets and a programming environment within which to develop, deploy and operate the necessary algorithms. The storage and processing requirements required for this task are significant and most readily provided in close proximity to the required data resources. In addition production of a regular ice analysis will require regular validation using independent data, which will be more easily achieved within the established processing chain given access to the necessary observation data. The ESA CCI Sea Ice project will combine and extend ongoing research to develop improved and validated time series of ice concentration and ice thickness for use in climate research. Since sea ice is a sensitive climate indicator with large seasonal and regional variability, the climate research community requires long-term and regular observations of these key ice parameters in both the Arctic and Antarctic. The ESA CCI Sea Ice project will deliver global data sets to support climate research and monitoring according to the GCOS requirements for generation of satellite-based data sets and products. Users of sea ice thickness estimates also include commercial players planning ship and offshore operations in ice covered waters. As ice thickness influences loads on structures, it is much sought after during infrastructure design phases and when planning operations. Advances in the processing of ERS and Envisat radar altimeter data has though shown that these instruments can be used to calculate low-resolution sea ice thickness data from measurements of ice freeboard. In addition to ERS and Envisat, in CCI Phase 2 estimates will also be derived from Cryosat-2 data. Operational processing chains will benefit from easier access to data, combined with access to scalable processing resources. The Polar TEP is of special interest to the sea ice thickness CCI since the European radar altimeter data is an input both for ice sheet elevation change and sea ice thickness retrieval. Some of the processing steps are identical or easily adapted from one application to another. In addition functionality for sea ice related altimeter data processing (such as sea ice dedicated re-trackers and ice type detection from waveform shape) may also be implemented. Also the iceberg detection from radar altimeter data is based on the same input data and waveform characterisation as sea ice thickness retrieval as the “iceberg echoes” are recognised and discarded from the SIT processing. Computationally, the heaviest part of the altimeter to SIT chain is the so called “retracking”. A retracker fits a mathematical model to the waveform, and using this model calculates the range representing the target surface. Lastly, the developers of altimeter sea ice thickness retrieval algorithms would benefit from the TEP. Currently, researchers tend to build and test their tools on a local computer with data downloaded on a local disk. Having a TEP that would allow the testing of their modules (for example retrackers or freeboard to thickness conversion) jointly with other researchers, which would allow the researchers to share and demonstrate their ideas and novel tools within their research community much faster than is currently possible. Furthermore the Polar TEP should include visualisation and data export tools for sea ice thickness. These will include averaging (both spatial and temporal) of processor outputs.